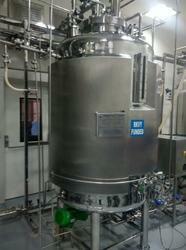 We are a leading Manufacturer of vaccine harvest vessel from Bengaluru, India. We are renowned as one of the most popular enterprises in this industry, offering Vaccine Harvest Vessel. The offered mixing vessels are acclaimed among customers owing to their optimum finish. These mixing vessels are designed with utmost precision using best grade material and advanced techniques. In addition, our entire range of mixing vessels is offered at the affordable rates to our clients. Looking for Bio-Technology Equipments ?